U.S. Imposes Sanctions On Venezuelan State Oil Monopoly Treasury Secretary Steven Mnuchin says payments from U.S. refiners will go into an escrow account until Juan Guaidó or another leader replaces President Nicolás Maduro. 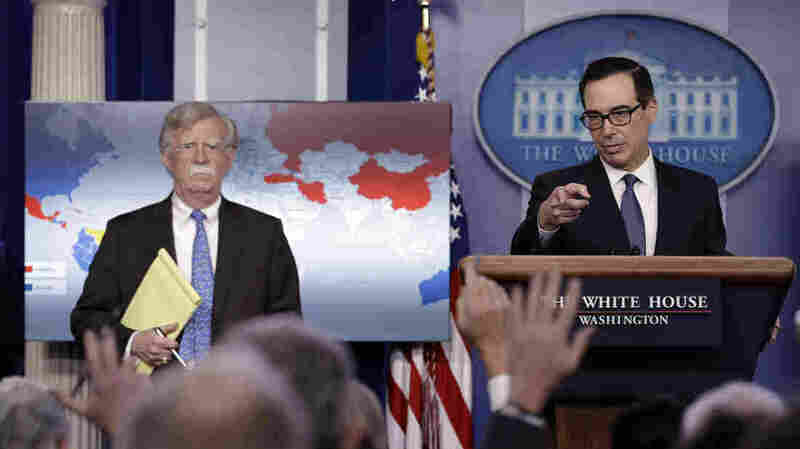 Treasury Secretary Steven Mnuchin (right) and National Security Adviser John Bolton announce sanctions against Venezuela at the White House Monday. The U.S. is imposing sanctions on Venezuela's state-owned oil company in an attempt to dislodge President Nicolás Maduro in favor of his rival, Juan Guaidó. Treasury Secretary Steven Mnuchin and National Security Adviser John Bolton announced Monday that all property of the PDVSA subject to U.S. jurisdiction will be blocked, and all U.S. citizens are prohibited from trading with them. That includes the Houston-based Citgo subsidiary of PDVSA. Mnuchin said the revenues earned by Venezuelan companies will be held in escrow until Guaidó has been granted control of the government or new elections are held in Venezuela. "These are valuable assets that we are protecting for the benefit of the Venezuelan people," Mnuchin told reporters Monday. National Security Adviser John Bolton said the moves were aimed at supporting "the legitimate government" of Guaidó and called on the military of Venezuela to support a "peaceful, democratic and constitutional transfer of power." The sanctions are the latest U.S. move to back Guaidó nearly a week after he declared himself interim president as protesters flooded cities across Venezuela. Guaidó, the 35-year-old recently elected to head the National Assembly, says his power comes from the Venezuelan constitution because Maduro won his second term by fraud. The U.S. and many Latin American countries recognized Guaidó at once, but Maduro has not agreed to step down. That leaves Guaidó the task of chipping away support in the military and judiciary, which have remained loyal to Maduro despite the foreign pressure. Over the weekend Venezuela's defense attache in the U.S., Col. José Luis Silva, switched sides to Guaidó, NPR has reported. In response, Maduro rallied troops at a base near Caracas, according to NPR's Philip Reeves. "Do you support a coup?" Maduro asked them. "No, President!" they answered in unity. Guaidó's supporters have handed troops copies of a law that grants amnesty to members of the armed forces who abandon Maduro, but several of them have burned the leaflets instead, Reeves reports. "But right now the things with Maduro have gotten really, really bad. People have no enough food, water, electricity. The minimum wage is worth nothing, so they're getting paid $6 a month. So it's really difficult for them to eat. And people start demonstrate spontaneously on the slum, which is something that we have never seen before in at least 15 years." Maduro still has support from Russia, China, Turkey, Iran and others. Secretary of State Mike Pompeo took up the cause of Venezuela's opposition Saturday at the U.N. Security Council, and he challenged what he called Maduro's mafia, NPR's Michele Kelemen reports. "China and Russia are propping up a failed regime in the hopes of recovering billions of dollars in ill-considered investments and assistance made over the years," Pompeo said. Guaidó has picked off limited support among the higher ranks of Maduro's government. Scarlet Salazar, one of Venezuela's consuls in Miami, recognized Guaidó as president in a video posted by journalist Carla Angola Monday. She pledged to continue giving consular services. "We exhort the other members of our diplomatic group and functionary Venezuelan consulates outside the country, to stick to the Constitution and the law of amnesty provided by the National Assembly," Salazar said. "We support our fellow countrymen at this time." Salazar is one of four staff in the Venezuelan Consulate in Miami, according to its website. Ivan Briscoe, program director for Latin America at the International Crisis Group, said Maduro may be trying to wait out Guaidó's challenge. "He could decided to wait this out, get some supplies from Russia and China as well as military support," Briscoe told NPR. "But there is a risk that with the added effects on the Venezuelan economy of all these recent measures that the situation becomes so deplorable that more will decide to emigrate, more will decide to protest, and some will decide it can't get worse, so we have to do whatever it takes." Talks between the U.S. and Venezuela continue despite the public faceoff, The Associated Press reports. After Washington recognized Guaidó as Venezuela's interim president, Maduro initially gave U.S. diplomats 72 hours to leave the country. Later he relented and gave them 30 days. He has framed Guaidó's challenge as an imperialist push by foreign powers. He wrote on Monday that Venezuelans elected him president with more than 67 percent of the votes, "well above what was achieved by the governments that intend to impose a coup in Venezuela. Here chooses the people, not the empire!" Alfredo Romero, the executive director of the human rights organization Foro Penal Venezolano, told NPR that the judiciary is also loyal to Maduro — for now. "Imagine that the judiciary are like soldiers of the regime. and actually it's being used, the judiciary system, as a weapon for political persecution," Romero said. "Still, if there is a risk of Maduro leaving power, and a risk to them to also lose power, they will think about ways to exit." Pope Francis, the first Latin American to hold the office, told reporters Sunday that he is "terrified of a bloodbath" in Venezuela. NPR's Gustavo Contreras contributed to this report.